TTC - Masters of Photography | Free eBooks Download - EBOOKEE! Posted on 2018-11-06, by everest555. Photography is an art. We may all take pictures-now more than ever-but to rise above the level of a snapshot, you need to go beyond shooting and hoping for the best. You need to actually understand what you're doing and anticipate the results. The best way to learn any art form, including the art of photography, is by watching a master artist at work. By observing the creative process of a photographer who has truly mastered the trade, you can gain rich insight into how to approach your own images, boost your confidence as you work, and improve your photographs by learning skills that are rarely shared or taught in an ordinary classroom. Now, in National Geographic Masters of Photography-24 lectures taught by 12 top National Geographic photographers-you gain unparalleled access to some of the world's greatest photographers. Through our partnership with National Geographic, the gold standard of photography for more than a century, we are able to collaborate with some of the organization's most talented photographers. As a result, we have brought together a dozen world-class experts for this one-of-a-kind instructional series that will forever change the way you approach photography. National Geographic Masters of Photography goes inside the creative process of the industry's most sought-after photographers as they reveal their working methods, from the planning stages of an assignment through the painstaking execution. Across 24 fascinating lessons, each professional uses his or her vast body of work documenting exotic locales around the world, as well as riveting stories of life in the field, to illustrate points and share invaluable expertise. As you explore their craft in units on Adventure, Wildlife, Landscape and Nature, People, Color and Light, and Storytelling, your guides take you far beyond Photography 101 territory into ground you'd never cover elsewhere-short of landing an apprenticeship with a photographer of this caliber. These lessons also touch on fundamental concepts of lighting, composition, and using your camera, but they're truly designed to help you learn to see as top professionals do, and to ultimately discover your own personal vision. Each unit is presented by a pair of photographers, exposing you to diverse perspectives on how to achieve captivating results. In the end, you'll come to see that having a good camera and knowing how to use it is important, but it's only a tool. Taking great photographs requires technical skill, plus preparation. As Michael Yamashita says, "the difference between a good photograph and a great photograph is often a matter of inches or milliseconds." After completing this course, you will possess a refined set of tools and insights you can use to drastically improve your photography, whether you're using an expensive camera or the camera on your phone. In this visual feast of a course, you'll gain insight on the elaborate process National Geographic photographers go through-both in the technical and artistic sense-from researching and planning a shoot to working a scene and waiting, often for hours, for the right elements to come together. Guided by multiple experts, you'll explore in depth the key three elements of great photography: good light, good composition, and a moment, as well as how to take advantage of the compositional concepts and principles they rely on every day. Ð²Ð‚Ñž approaching and working with subjects. Ð²Ð‚Ñž lighting scenes effectively-whether your source is the sun, a flashlight, event lighting, or your camera's flash. With these insider tips, everyone from the novice to the accomplished amateur will find ideas for enhancing their picture-taking skills. At the conclusion of each presenter's session, you'll be inspired to go out and apply your newfound knowledge based on an assignment outlined by the photographer. The Scottish isles. Paris. The Niger Delta. Papua New Guinea. Take a dazzling visual journey to these locations and many more as you join these globe-trotters for a behind-the-scenes look at precisely what went into getting the shot-and the trouble some found themselves in overseas. Even if you're already a skilled photographer or simply an appreciator of art, the gripping images and stories these esteemed experts share make the experience highly worthwhile. From arresting tales of surviving sub-zero temperatures in Antarctica to risking life and limb to document the perpetrators and victims of human trafficking, the experiences and worlds that will be revealed to you are nothing short of spellbinding. Ð²Ð‚Ñž In the Adventure section, Cory Richards takes you high into the Himalaya and deep under the sea, while Stephen Alvarez brings you to remote places no one had ever before witnessed. Ð²Ð‚Ñž In Wildlife, Steve Winter demonstrates how understanding animal behavior informs his work, then Joel Sartore shows you how to apply your knowledge to not only highlight animals, but also potentially make a difference on their behalf. Ð²Ð‚Ñž In the Landscape unit, Jim Richardson takes you from the Hebrides of Scotland to the American West, demonstrating how he experiments to work a shot. Michael Yamashita draws parallels between Japanese gardeners and landscape photographers, showing how both use light and color to direct the eye. Ð²Ð‚Ñž In the section on People, Jodi Cobb explains how she gains access to hidden worlds, from geisha houses in Japan to the tents of Bedouin women in Saudi Arabia. Then, Ira Block describes how he builds relationships with people of other cultures, even in the most hostile environments. Ð²Ð‚Ñž In Color and Light, Michael Melford describes the four kinds of light photographers seek-but demonstrates that it's possible to work with any kind of light, given enough perseverance. Annie Griffiths communicates the joy of experimenting with color to evoke an emotional response. Ð²Ð‚Ñž In Storytelling, William Albert Allard uses images from his 50-year career to illuminate how you can incorporate place and moment to tell stories visually. Conclude with Ed Kashi discussing types of storytelling-from advocacy journalism to the way digital photography and the Internet allow for new kinds of narratives. 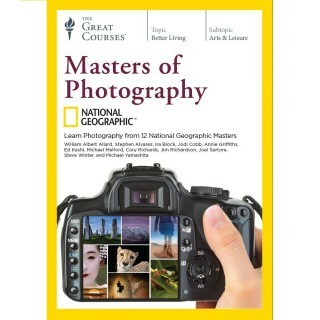 To say that National Geographic Masters of Photography is visually stunning would be an understatement. Words simply cannot do justice to the spectacular images presented by all 12 master photographers in this course. Breathtaking, awe-inspiring, and at times shocking and heartbreaking-their work represents the pinnacle of the art form. Beyond revealing professional secrets and supplying you with a toolbox overflowing with techniques you'll put into practice every time you lift your camera, these lessons offer a personally enriching journey like none other. No comments for "TTC - Masters of Photography".